Make your stuffing this holiday season outside of the bird with this recipe for sourdough Thanksgiving stuffing with apples, sausage, mushrooms, leeks and celery. I promised you a Thanksgiving stuffing recipe in my kick-off post for Thanksgiving week on Sunday, and I’m so excited to share it with you today. This recipe is loaded with all the comforting, Thanksgiving flavours you know and love. Other than dessert (if you’re looking for a pie, look no further than my layered pumpkin-pecan pie), I think that stuffing is the dish to bring to a Thanksgiving potluck. But it’s a bit of a hot-button Thanksgiving topic because there are a few different camps when it comes to stuffing. The first is meat or meatless? I grew up with a meat version of stuffing, so that is what I gravitate towards. Similar to those of you who grew up with canned cranberry sauce instead of fresh. It’s the nostalgia factor. I think that Thanksgiving is a holiday that is laced with nostalgia, it’s one of the reasons I love it so much. The next divisive camps for stuffing are whether you prefer your stuffing on the side or used to actually stuff the bird. 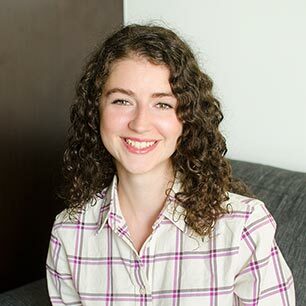 The truth is, I grew up in a house where we always had the stuffing on the side because my Mom and sister both have allergies to gluten, so we could never have traditional stuffing in our turkey. My aunt, who makes the most delicious stuffing, brings over a huge tray of it every year (and there’s always meat in it). 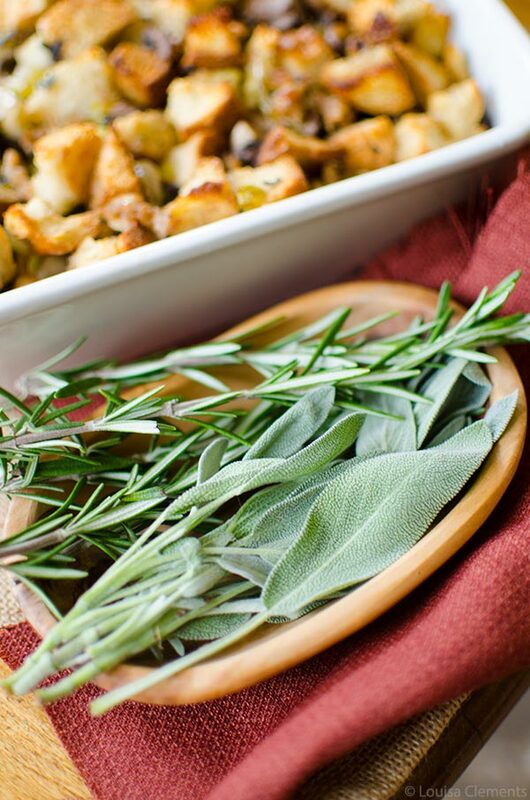 The flavours of this stuffing come from a few things. First of all, I decided to use sourdough bread because it’s one of my favourite types of bread and I love the slight tang it gives for this twist on the traditional Thanksgiving stuffing. I’ve also used a combination of leeks, cremini mushrooms, celery and Granny Smith apples to make up the vegetable components of this dish. You’ll also find some breakfast sausage in here for good measure; it adds savoury and salty notes to this dish without overpowering it. There’s also butter and salt because, after all, it’s the holidays. Live a little, I promise you there will be plenty of time for healthy veggie loaded soups between now and Christmas, but for now, let’s just embrace butter and all things comforting and delicious. This stuffing recipe is perfect if you’re making my recipe for slow cooker turkey breast because you can’t stuff a turkey breast, so stuffing on the side is a must. 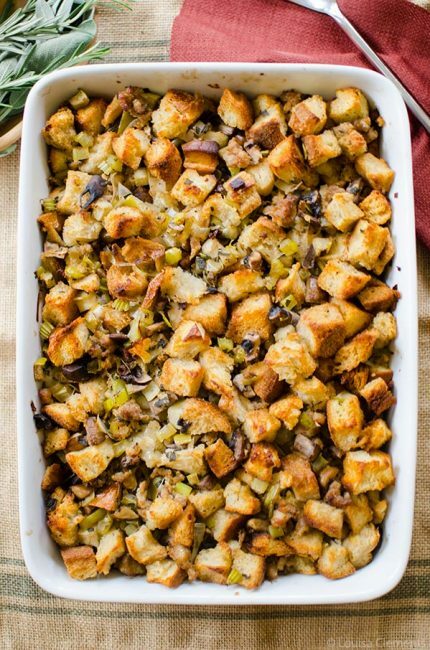 It’s also great if you’re in charge of stuffing to bring to your Friendsgiving or family potluck. This bakes up in a 9×13″ pan, which is the perfect amount to feed about 8-10 people for Thanksgiving or Christmas. A quick tip about making stuffing, I recommend buying the bread a full day before you’re planning on making the stuffing because if it’s a little stale, it’s easier to cut into cubes. I made the mistake of testing out this recipe with fresh bread, and it was so much harder to cut because it was just too fresh and ended up getting smushed instead of slicing into perfect 1/2″ cubes. Preheat oven to 375F. Arrange cubed bread in a single layer on a large baking sheet, toast in the center of the oven for 20 minutes, stirring halfway through. Reserve. Reduce heat to medium-low, melt butter, add celery, leek, apple and mushrooms, season with salt. Cook for 6-8 minutes or until softened. Combine toasted bread with celery mixture, sausage and herbs in a large bowl. Add 1 cup of broth and stir to combine. Dump into a 9x13" baking dish, pour remaining 1 cup of broth overtop. Bake in the centre of the oven for 35-45 minutes. 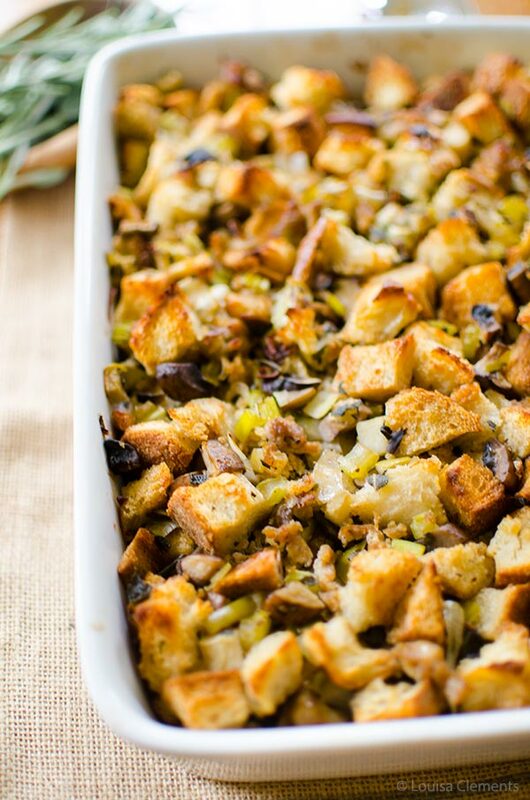 Let me know if you give this sourdough Thanksgiving stuffing a try — it’s also great a great stuffing recipe for Christmas!